A good business sign often starts with a great logo! Logo design requires a lot of attention to detail, as it gives people an idea of what your company represents. It must be clear and memorable to keep your brand unforgettable. If your company is in need of a new image, our professional designers can work with you to create a logo that’s true to your organization – whether it is updating your current logo to bring a fresh look to it, or creating a brand new one from scratch. Through creative consultations and our innovative design process, we can deliver a look that will put a new face on your business. Give your business a fresh start. Talk to us about a new logo design today. We have had the pleasure over the past few years to work with Scott Jenneman and Jason Joel, the owners of both Mall of Georgia Kia and Mall of Georgia Chrysler/Dodge/Jeep in Buford Ga. We have done several projects with them including post and panel systems, wall murals, window graphics and various other types of signs. This year, 2014, is a big year for them. 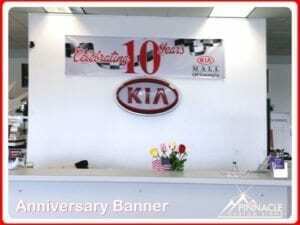 The KIA dealership is celebrating their 10th anniversary and the Chrysler/Dodge/Jeep dealership is celebrating 20 years. They approached us to come up with an anniversary logo for both dealerships that would incorporate some of their current logos and have a celebratory look to them. After a few different rounds of design changes, we came up with one that worked perfectly for them. 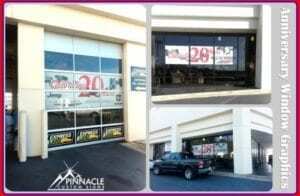 At this dealership we installed window graphics on the windows for both the showroom and the service garage. We also did a quantity of static clings for them to put on various other windows at the dealership. Next up was the Kia anniversary logo. We kept the look and feel similar, but changed things up some so that the Kia brand stood out. The logo was approved and we produced banners and static clings for this dealership. They will be using these logos throughout 2014 on other projects to promote the anniversary celebrations. A good logo design should reflect the universal feeling of your company. In designing your logo, ask yourself, what is the most important service we provide to our customers, who are we trying to attract and what is the most important feature of our business? Businesses developing designs should contemplate the answers to these questions in order to articulate they want their business logo to say. No one likes to feel puzzled. If your audience spends too much time trying to decipher out your design, chances are they forget who you are and move on. A professional will take these factors into account and help you design something unique that can stand the test of time. If you need some help, we offer Logo Design as a service.